If you want to spend some time touring the UK but you want to make sure that your carbon footprint is as low as possible then a good way to do it is by train. When we say ‘rail’, we don’t just mean those fast trains that take you from city to city as quickly as possible – we mean the scenic routes that give you the opportunity to slow down the pace of life a little. 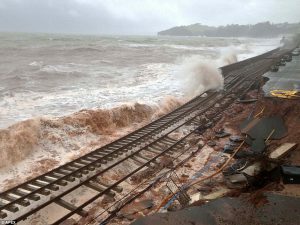 The Sea Wall Line at Dawlish is a must for those who love to be able to see the sea when they travel. This used to be the most famous holiday train journey in the UK. It leaves from Exeter and heads down the coast, showing you some of the most spectacular views. There are those who would prefer a scenic inland journey and if you want to travel in the footsteps of Harry Potter there is only one way to do this. The Jacobite steam train on the West Highland Line in Scotland was made famous by the films and a trip over Glenfinnan Viaduct is one that you will never forget. The Settle & Carlisle line is a trip through the Cumbrian Hills and this line was only saved from closure a few years ago after a major campaign. This trip takes in the Ribblehead Viaduct and the views from here are amazing. For one of the newer routes you can visit Wales and take a trip on the Welsh Highland Railway. This runs from Caernarvon into the Snowdonia National Park. This is a narrow gauge line and the trains are small, but this is the longest narrow gauge line in the UK. Again, the views are fantastic and people come back time and time again to enjoy this trip meandering through the Welsh countryside. After a long walk around the British Isles you might be thirsty for a cold pint & a warm stew. Why not dine in one of England’s oldest pubs?